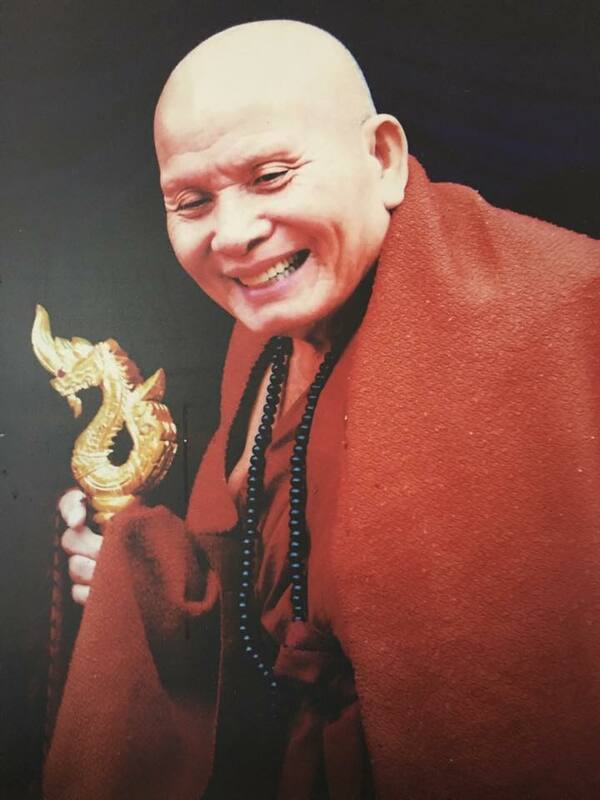 KB Boonyang is a worshipful Northern guru monk at Wat Huai Nam Aoon in Lamphun province. He is a disciple of Kruba Jao Chaiya Wongsa of Wat Phrabat Huai Thom, a respectable senior monk. Many Thai people know of KB Boonyang and visit him at his temple often. 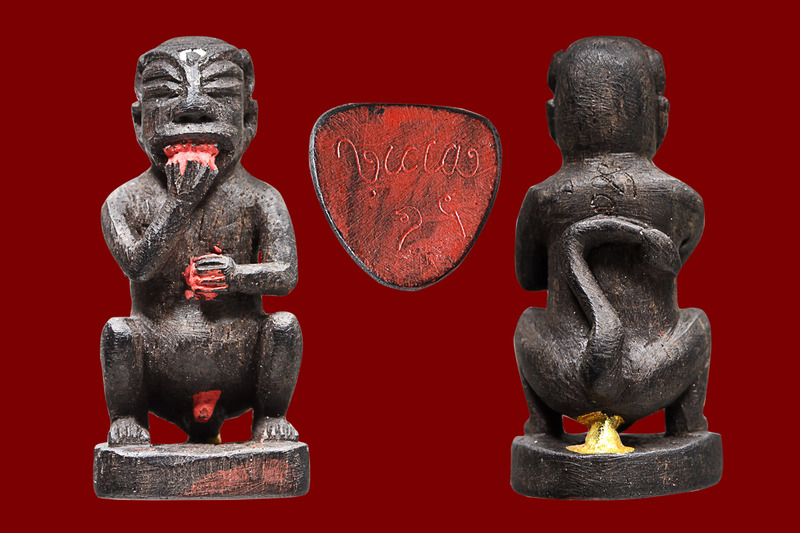 Moreover, KB Boonyang is famous for lucky "See Hu Ha Ta", amulet in form of a monster with four ears and five eyes according to Northern Thai folklore. 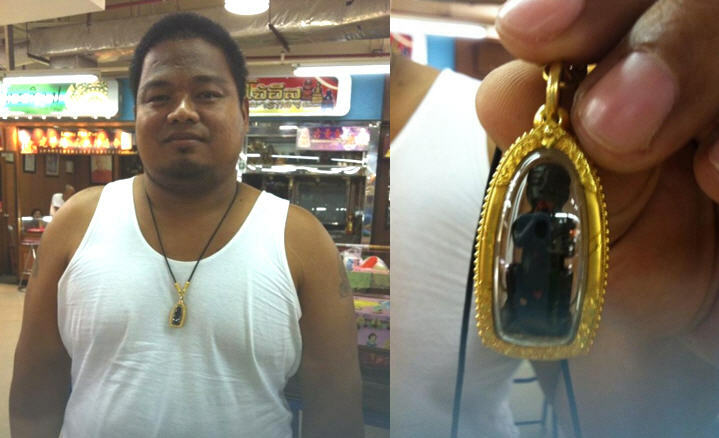 The owner of See Hu Ha Ta by KB Boonyang promised to amulet if he successfully offered a project, we would give amulet a golden casing and hang on his neck. That night, he dreamt of the spirit of See Hu Ha Ta and next day the client approved his project on the phone. 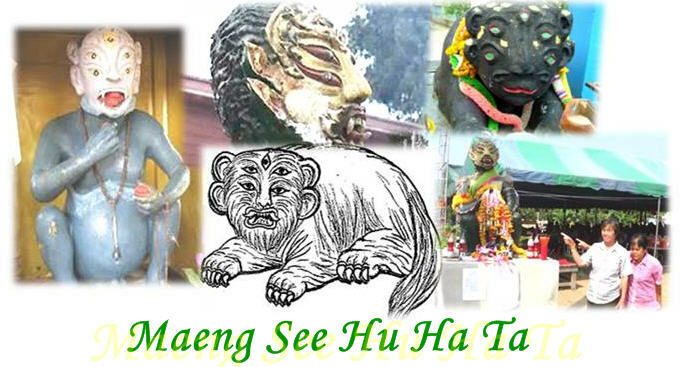 "See Hu Ha Ta" (also "Thep Inn") is a lucky monster with four ears and five eyes according to Northern Thai folklore. The myth says Lord Indra transformed himself into a monster that had got four ears and five eyes to help people. This is its story. Once upon a time, there was a beggar family. That family had 3 members: father, mother and son. Then mother died. After that, father died. Before father died, he told his son to bury his dead body and take out his skull when it falls out. Father told his son to roll his skull along the ground. Father told his son to make a trap where his skull stops and take a trapped animal home to feed. Father said a trapped animal would bring good luck. After father died, his son did all what his father told. One day, a monster was trapped. It looked like a gorilla with four eyes and five eyes. The son brought the monster home. When he got home, he made a bonfire. The monster was so hungry and ate red charcoals in front of him. The son was amazed. Moreover, when the monster finished, it produced gold feces. The boy kept the gold in his garden and soon his garden was full of gold. One day, the son heard the news that the king was finding the bridegroom for his daughter, but it was not easy. The king challenged all men in the town that he will give his daughter when the man could build the gold gutter to the castle. No one could, except the son. He used gold feces from the monster to build the gutter. The son married the princess as he wished. However, the king was anxious to know how his son - in - law could get the gold. The king asked the son and the son told the king everything. So, the king and his guards came to catch the monster. When they arrived, the monster was frightened and ran way. It went in the cave. No one saw the monster ever since. From this story, northern people believe See Hu Ha Ta can bring good luck and fortune. Power: TAO WET SU WAN is the king of all demons. He is a bodyguard of Buddha and a guardian of the temple. So, you can see the statues of Tao Wet Su Wan in Buddhist temples. Thai people believe Tao Wet Su Wan can protect them from bad spirits, black magic and bad things. Furthermore, Tao Wet Su Wan is the symbol of wealth because SUWAN means gold. Thus, people who worship Tao Wet Su Wan will be safe and wealthy. Power: Brings progression in career and turns enemy into friend. Don't miss this amulet if you are a luck hunter because this amulet has manifested real experience. Be sure to try and become another lucky worshiper! !